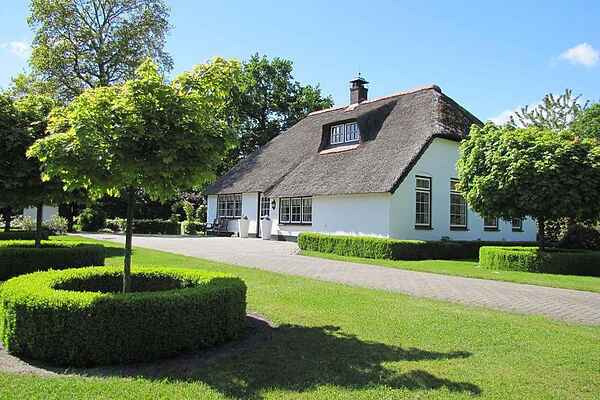 This thatched farmhouse is nestled in the greenery, in a rural location between Dalfsen and Nieuwleusen. The house is situated on a plot of 9000m2 that is completely enclosed by trees. The house has a classic modern decor, with spacious bedrooms, a living room with open fire and a bathroom with a bath tub. The kitchen is spacious and equipped with all comforts. This house also has separate guest accommodation, with its own kitchen, bathroom and living room with television. This makes this house is very suitable for family holidays for families with children, where the grandparents still want to have their own space. The beautifully landscaped garden has a large pond, extensive lawn and beautiful terraces and is certainly a very nice place to stay in good weather; children can also entertain themselves playing table tennis. In the direct surroundings there is the Bellingweer nature park, that is well worth a visit, especially for people who enjoy fishing. The city of Zwolle is only 15 km away and offers more shops and culture.